If you need to raise your aquariums alkalinity level or just want a high-quality additive for daily 2-part dosing, BRS Pharma Sodium Bicarbonate is a great alkalinity solution for any reef tank. BRS 2-Part Pharma additives need to be dissolved in RODI water before being dosed to any saltwater aquarium, which only takes a couple minutes. We offer Pharma Sodium Bicarbonate in bulk 7-pound bags and also pre-portioned packages that make measuring and mixing even easier. Sodium Bicarbonate is ideal for large changes in alkalinity or for aquariums with a naturally high pH. Add 1 household measuring cup and 2 tablespoons of BRS Pharma Sodium Bicarbonate or a single Pre-Portioned package to the 1 gallon jug. Replace the cap and give the container a few more shakes and let it sit until the salts are fully dissolved which may take 24 hours or more. Using the BRS Reef Calculator Choose alkalinity for the element, Liquid Sodium Bicarbonate for the product, and the type of New Pharma Pouch. The result will be how much of the BRS 1-gallon Liquid Sodium Bicarbonate solution that should be required to increase your aquariums alkalinity level. Go to the BRS Reef Calculator and input your new desired level and your new current level along with your total system water volume. 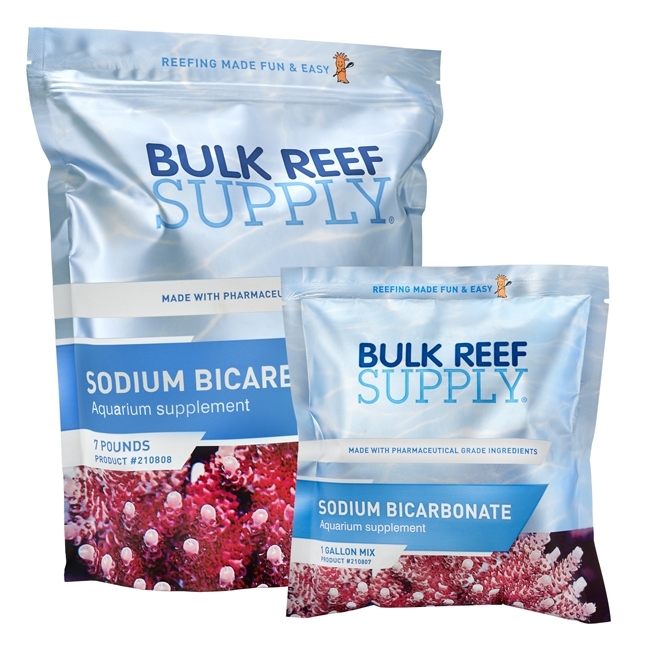 Input your values into the BRS Reef Calculator making sure to use the BRS Liquid Sodium Bicarbonate (New Pharma Pouch). The amount calculated will be the total amount of solution needed for a 5-day span of time. To know your daily dose just divide that number by 5 (see example below). Sodium Bicarbonate is great for aquariums that have a naturally high pH. Unlike soda ash, sodium bicarbonate will have a slight lowering effect on your aquariums pH.